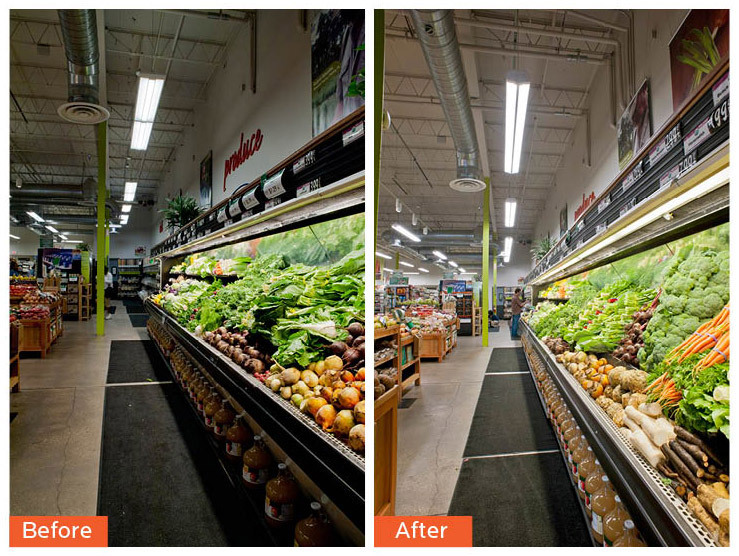 Sophisticated retailers have known about the benefits of high quality lighting for years. Quality lighting enhances the perception of merchandise value and the environments in which products are sold. High quality lighting, especially when it uses high color rendering index (CRI) sources, displays colors more vividly, this is crucial for the surfaces of fabrics and furniture, as well as for food, produce, jewelry, clothing, and automobiles. Contrasts (i.e. the effect of light and dark areas) are decisive. These contrasts are enhanced by the careful use of directional display lighting. Customer behavior in retail areas is influenced significantly by perception and a sense of well-being. Light is an important design tool which impacts these parameters. LED lighting makes customers more comfortable, and customers who are more comfortable tend to stay longer and shop more. Directional lighting can greatly enhance the desired traffic flow through a retail space, guiding customers to intended point of sale areas, because light conveys emotions, lends spaces atmosphere and makes it easier for people to find their way around. and jewelry retailing as well as in hospitality, where the positive effects of socializing is enhanced when people look better.